Showing off the completed interior and exterior in one place for the first time, the super expensive Aston Martin One-77 won the design award for concept cars at Villa d'Este this weekend. The £1.2 million supercar is suffering from exchange rate fluctuation-itis. Back in March it would have cost you just $1.4 million freedom dollars, but now, with a stronger pound, one of the 77 7.3-liter, 700+ HP V12 Astons will set you back a whopping $1.75 million. Bet you wished you'd placed your order earlier, don't you? Gaydon, Warwickshire 26 April 2009. At its world debut this weekend, the Aston Martin One-77 has won the Concorso d'Eleganza Design Award for Concept Cars and Prototypes on the shores of Lake Como, Italy. Following the Geneva Auto Salon in March, where the technical illustration was first shown, the rolling chassis has since been completed by hand into the first car presented at Villa d'Este this weekend. At its first public unveiling in the perfect setting of the Grand Hotel Villa d'Este, the first complete One-77 was on show. Visiting public were invited to cast their vote for the best concept and prototype. 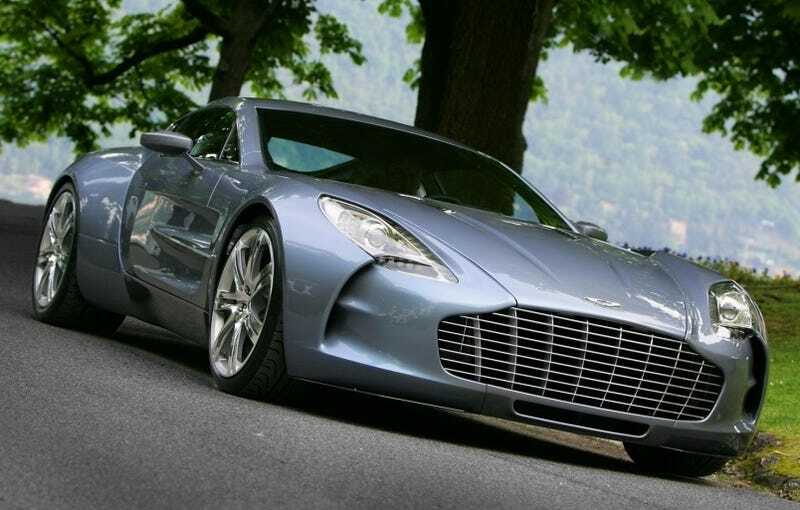 Among eight entries from around the world, the Aston Martin One-77 was voted the best in class, eclipsing the competition with more than 30% of the total votes. Admiring crowds viewed One-77 in its entirety for the first time. The car was showcased complete with running powertrain and the never seen before, fully hand-crafted interior. Aston Martin Chief Executive, Dr Ulrich Bez said: "Embodying everything Aston Martin stands for; the One-77 has proven itself as the most desirable automotive art form at its premiere today. "We have achieved a new level of design and craftsmanship which has been clearly recognised by the public here in the homeland of design at Villa d'Este." Aston Martin Design Director, Marek Reichman said: "To win this award at its first showing is a testament to the Aston Martin team and the original concept. Winning here today has proven One-77 as a benchmark in automotive design."